Marvel fans have been trained to stay seated for the entire credits after any movie in the Marvel Cinematic Universe, because there is almost always some kind of post-credit scene to be enjoyed. Sometimes there is even two. But it looks like Guardians of the Galaxy Vol. 2 is going to really up the stakes as there is not one, but five end-credits stingers attached to the movie. With the release date a little more than two weeks away, Marvel Studios screened Guardians of the Galaxy Vol. 2 for critics last night. Those who saw the movie learned that it has more than the usual amount of post-credits action for a Marvel movie. Director James Gunn even took to Twitter after the screening to confirm that the movie will have a total of five post-credit scenes. He made the clarification that Guardians of the Galaxy 2 is going to have five, not four, post-credit scenes after ScreenRant initially ran a piece saying there would only be four. Gunn states the following clarification. Going all the way back to the original Iron Man, post-credit scenes have been a huge part of the MCU. The scenes aren't always overly important. Sometimes they are just meant to be a little fun, like the shawarma scene at the end of The Avengers, for example. But with a total of five scenes running after or during the credits of Guardians of the Galaxy Vol. 2, there are sure to be at least a couple of things really worth checking out. Maybe we'll get some kind of tease for Avengers: Infinity War? Maybe Howard the Duck will be making a return to the big screen? In any case, it looks like James Gunn and Marvel really decided to go all out this time around. The early response to the movie from critics on social media has been largely positive so far for Guardians of the Galaxy Vol. 2, but there are some who feel that the movie doesn't quite live up to the original. Still, Marvel Studios clearly has a tremendous amount of confidence in the movie and it is likely to rake in big bucks at the box office when it finally hits theaters, so they are probably right to be confident. James Gunn announced recently that he has already agreed to come back to write and direct Guardians of the Galaxy 3, which means that things must have gone well with this first sequel. Nobody knows yet what records Guardians of the Galaxy Vol. 2 is going to break at the box office, but we already know that it is going to break the record for most post-credit scenes, that much is certain. 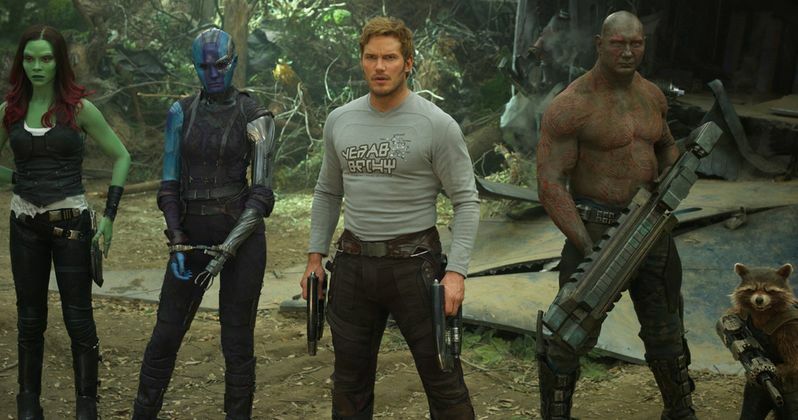 The Guardians 2 cast includes Chris Pratt, Zoe Saldana, Dave Bautista, Vin Diesel, Bradley Cooper, Sylvester Stallone, Pom Klementieff, Elizabeth Debicki, Karen Gillan, Michael Rooker, Sean Gunn and Kurt Russell. Guardians of the Galaxy Vol. 2 is written and directed by James Gunn and is set to hit theaters on May 4. The Guardians will return next summer in Infinity War and we may even get a Guardians of the Galaxy Christmas Special in the very near future.